This Taco goes Hard (shell)! An Intergalactic Space adventure that feels foreign and familiar simultaneously. Punk Taco walks that same hero path I grew up admiring in my youth. He seems to be someone who’s trying to do the best he can spreading love and keeping away from trouble, but that trouble seems to somehow find him. Don’t start none, won’t be none. He’s a hero that if challenged or threatened, someone might not like the consequences. Reminds me of my all time favorite anime that I watched as a kid about the positive minded, race car driving teenager behind the wheel of the Mach 5! With some incredibly beautiful colors, very unique character designs (french fry mohawk! 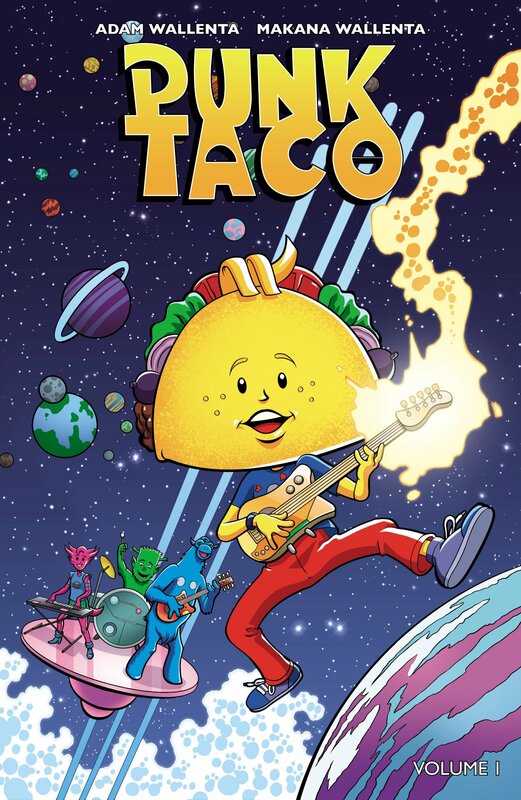 ), and an unpredictably building storyline, Punk Taco is an all ages Sci-fi comedy adventure that has a little something for everyone. There’s definitely some messages for the youngsters, and a few themes that some adults will easily recognize. Is it strange that I actually learned something from a guitar playing Taco?